Devil May Cry 5 is getting some lavish special editions – at least in Japan. 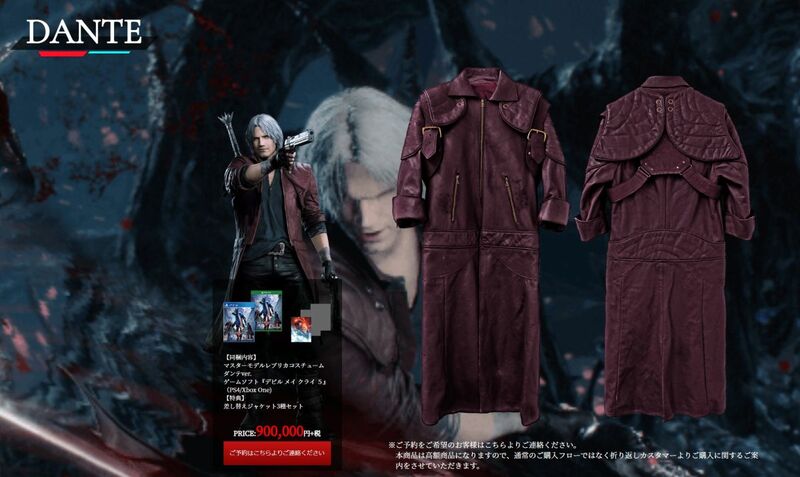 Per Capcom’s Japanese site for the upcoming hack-and-slasher, the most expensive edition – priced at an eye-watering ¥900,000 (about $8,000 before tax) – comes with a wearable and irresponsibly detailed replica of Dante’s iconic red leather coat (pictured above). There’s also a ¥750,000 ($6,600) edition for Nero, one of Devil May Cry 5’s other playable characters, which comes with his blue jacket. Nero lost his right arm and uses a robot arm to fight in-game, so naturally the right sleeve on the jacket is torn. Finally, there’s a ¥600,000 ($5,300) edition for V – DMC5’s third and most mysterious playable character – and his, uh, sleeveless robe thing. Capcom’s site describes the jackets as “master model replica costumes,” which jibes with a tip Kotaku received suggesting they’re based on the props worn by DMC5’s motion capture actors. For those hungry for DMC swag but frightened by all the zeros in the prices above, Capcom is also offering a tamer, ¥11,852 ($105) special edition which comes with an embroidered DMC5 button-up. All of these editions also include the base game and three pieces of alternate cover art. However, none of them have been confirmed for release outside Japan. For the time being, all we have is the standard $70 deluxe edition which comes with alternate skins for several characters, a bunch of red orbs you can use to level up quickly, and a bundle of gear like new robot arms for Nero and a revamped version of Dante’s Cavaliere motorcycle.